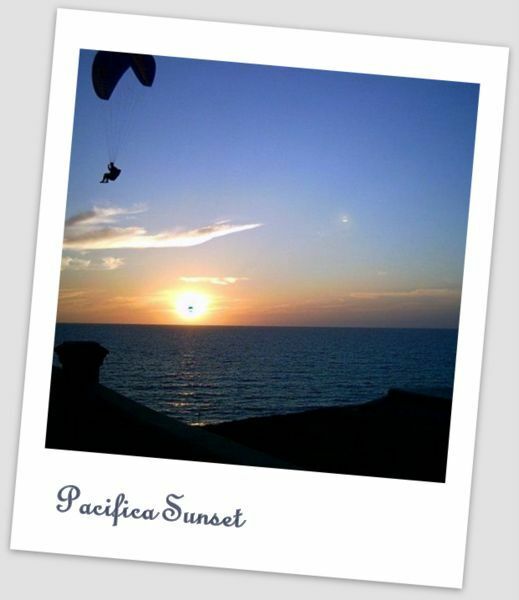 San Francisco may be famous for its fog, but locally, Daly City and Pacifica are thought to have SF beat. Of course, in the fall, all bets are off as we head into our most summery time of the year. For the last 25+ years, Pacifica has embraced its fogginess with the Pacific Coast Fog Festival, complete with arts and crafts, live music, and even a parade spotlighting rust adorned jalopies. And several years back, they added a cooking competition for … (drum roll please) … split pea soup. Presented here today is the winner of the inaugural event. This was my first cook-off, and little did they know, split pea is the one soup I had pretty much perfected. It was time to see whether it could stand up to competition, and it did. Despite the cutesy phrase “Where in the fog is Pacifica?” — one of the best kept secrets is that Pacifica isn’t nearly as foggy as people think. In any event, I submitted my recipe to the local paper, then after reviewing the submissions, the food columnist who shall remain nameless picked finalists to prepare their dishes for a panel of judges. It really was a lot of fun, and I took great pride in watching the judges going back to my bowl over and over, whispering, nodding, and then when they announced the winner, raving. Just like cook-offs and bake-offs across the country, I savored the moment and couldn’t wait to defend my title the next year! Unfortunately small town politics prevented THAT from happening. True story. Although I continued to submit my recipe in subsequent years, hoping to defend my original title, after reviewing all the submissions, I would get a call from the paper telling me that they hadn’t received any quality submissions, so it wouldn’t be “fair” to allow me to participate again so soon. How silly! Eventually, I told them to bugger off. Then one year they decided to retire the competition and announced I would be participating in a final contest among the prior years’ winners. OK I’ll be a good sport and play along. Ultimately, though, I didn’t attend, and it all came down to the obviously controversial … wait for it … “gouda crostini.”Â Yep, on the eve of the competition (we’re talking after 9pm! ), the food columnist called me to discuss eliminating the gouda crostini from my recipe. You see, it gave me a slight edge, and it wouldn’t be “fair” to the others who hadn’t thought to include a crouton of some sort. Just so we’re clear, I was competing against restauranteurs, caterers, and other professionals in the food industry, yet a crouton gave this home cook an “unfair” advantage! If ever something were so bad it’s funny, this would be it. But now on to more important things, such as this soup! Look at all these beautiful, fresh ingredients. This week my butcher hooked me up with these fabulous smoked ham shanks. I can’t imagine going back to ham hocks after this. Most pea soups start with water. I use chicken broth. Trust me, it’s for the best, but make sure you use the low or no sodium variety, or the overall saltiness can get out of hand.Â Bring this to a boil, add the carrots, split peas and ham shanks, then lower the heat and simmer for 45 minutes.Â Fish out the carrots before proceeding (they were just in there to lend some sweetness). 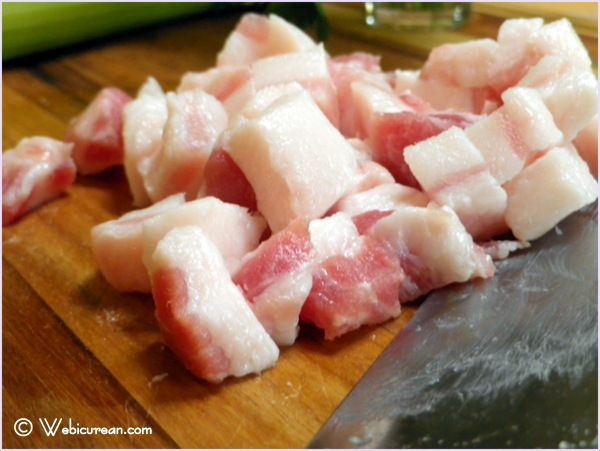 While the split peas and ham hocks are simmering, chop up the salt pork, and sautÃ© in a large non-stick skillet until crispy brown. 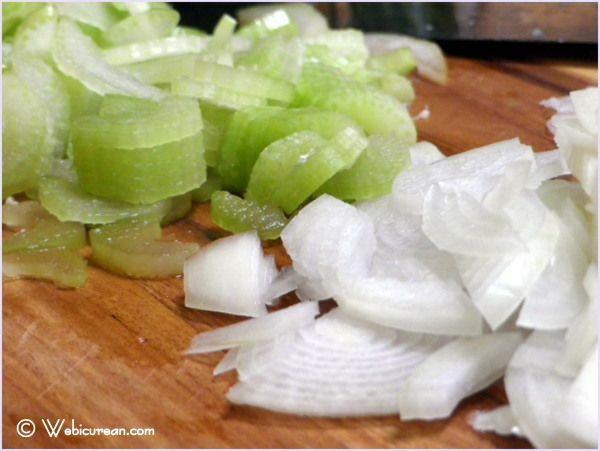 Meanwhile, slice up the onions and celery. 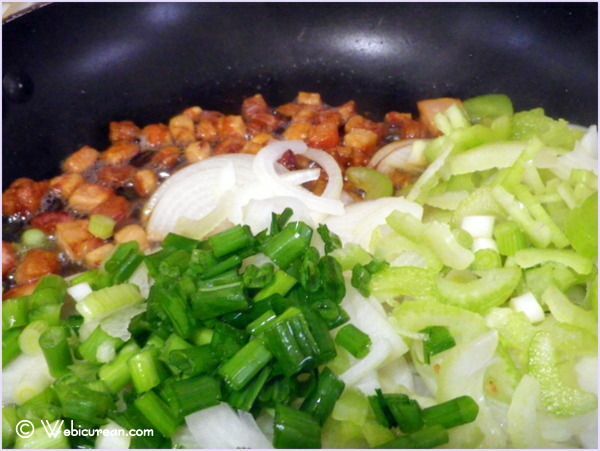 Once the salt pork is crisped up, add the onions and celery to the pan, and sautÃ© until the onions start to brown. Add the onion/salt pork mixture to the broth, along with the fresh parsley and dried herbs. Give it a good stir, cover, and simmer for 2 hours. After the soup has simmered for 2 hours, remove the ham shanks. The meat should be falling from the bone. Chop it up, and stir it back into the soup, along with 3/4 cup shredded gouda, and a cup of frozen petite peas (optional, for a sweet contrast). Simmer for an additional 30 minutes. 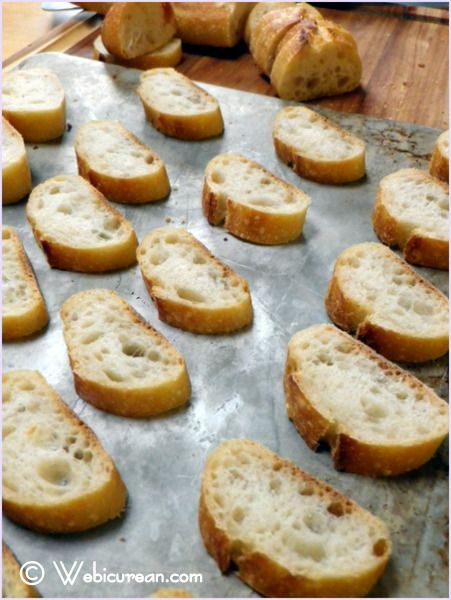 Meanwhile, slice up the baguette and spread out the slices on a cookie sheet. Broil until golden on top. Remove from the oven and allow to cool for a couple of minutes. 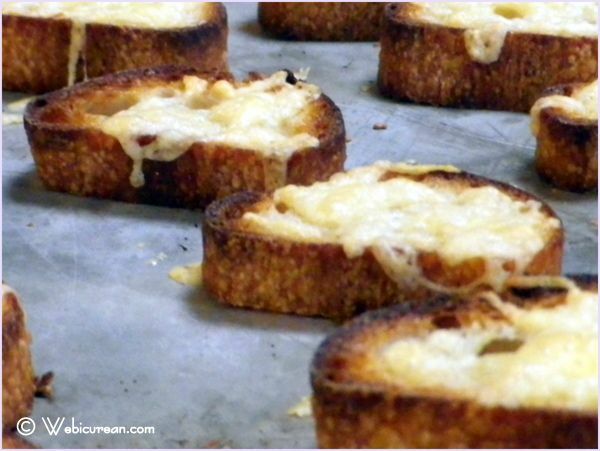 Take a garlic clove and rub it on the browned side, then return the slices to the cookie sheet browned side down.Â Top each piece with about 1-2 teaspoons of shredded gouda, then return to the broiler until golden brown and bubbly. Inspired by McCall's Cooking School. 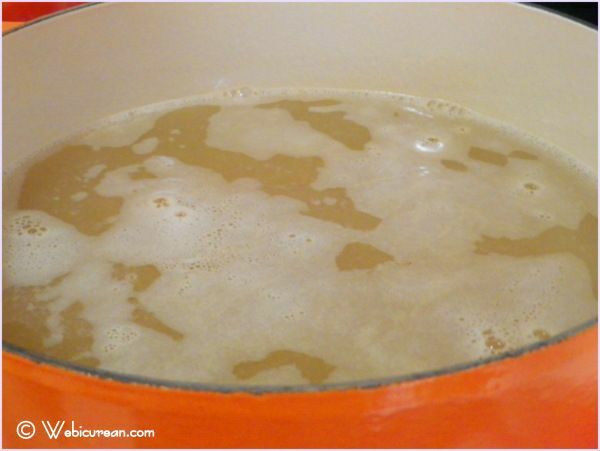 In a large stockpot, bring chicken stock to a boil and add carrots, split peas and ham shanks. Reduce heat and simmer 45 minutes, covered. Remove and discard carrots. To the peas and shanks, add the sautÃ©ed salt pork mixture, parsley, rosemary, pepper, and bay leaf. Mix well. Bring back to a boil, then reduce heat and simmer for 2 hours, covered. Remove from heat. Remove shanks from pot and cool. Chop meat, and add meat to pot along with the ¾ cup gouda and petite peas, if using. If soup seems too thick at this point, stir in a little water. Bring back to a boil, reduce heat and simmer for another 30 minutes, covered. Rub garlic on browned side and turn over. 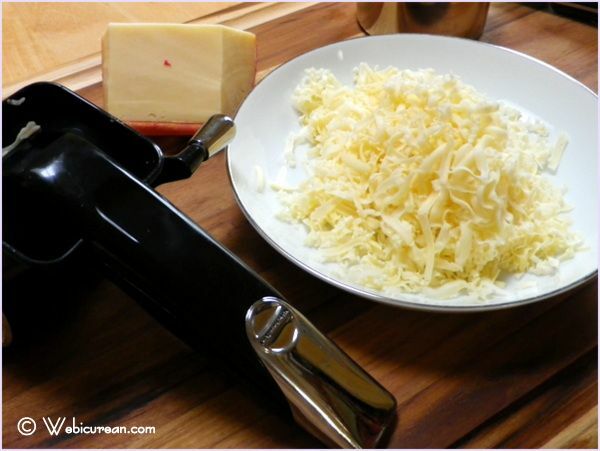 Place enough gouda on untoasted side to cover â€“ about 1-2 teaspoons. Return to broiler and cook until cheese is bubbly and golden. Set aside. Serve soup immediately with crostini as a garnish. Next week stop by for some Drunken Pumpkin Bread. With the exception of the gouda, this recipe is so close to mine! I am sure that it is the gouda that puts it over the edge. I can’t wait to try the soup and the crostini. Thanks for stopping by! I think you’ll enjoy the extra creaminess it adds … and those crostini are pretty tasty, sometimes I make those on their own just to snack on! Hello, I prepared this recipe with a couple changes, added cubed pork rib meat for meat variety, potato, shredded carrots and a little salt. Entered the soup in a New Year’s Day soup contest and won. Yippee! That’s so awesome–congrats! I love the idea of extra meat–think I’ll give that a try next time I make this! This sounds so good! But I love carrots, when would you put them in if you wanted to keep them in the soup? I stumbled upon this recipe last year and just had to make it. DELISH!!!! I’ll never eat split pea soup out of a can again!!!! My boyfriend loves soup and when I showed him a photo he asked if we could make this soup over the weekend. Hi Shay–so glad you enjoyed it! I’m with you–no more canned split pea! I have never heard of salt pork. What is it? Thank you so much for this recipe, which I just made tonight for our dinner company! It was so amazingly good, and such a well thought out recipe. 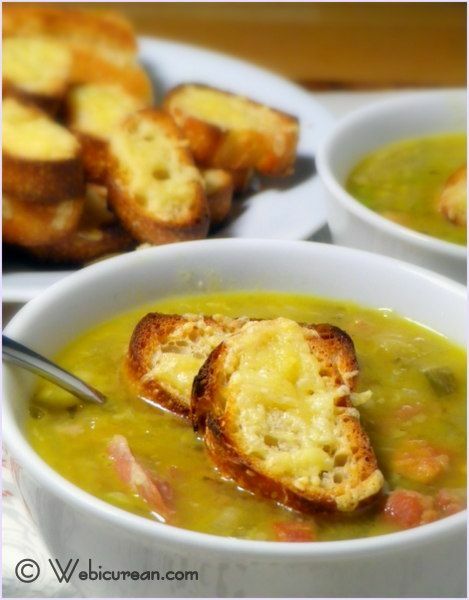 I made this for my guests, since one of our friends happens to love split pea soup and he devoured every last bite of it and everyone including myself was amazed at how good it was! The blend of flavor was so aromatic, meaty and just a downright hearty soup.. Mm can’t wait to make it again!!! Hi there! This recipe looks amazing and I am SO excited to try it. I love split pea soup but I’ve never made it myself–I have a ton of a ham stock and leftover ham from Christmas–should I treat my leftover ham the same way you treat the salt pork or should I do something different? I may also add bacon because the bf basically won’t eat vegetables unless they have something to do with bacon. Hi Natalie–sorry for the delay in getting back to you–for some reason, I’m not getting notifications of new comments 🙁 Is the ham on the bone? 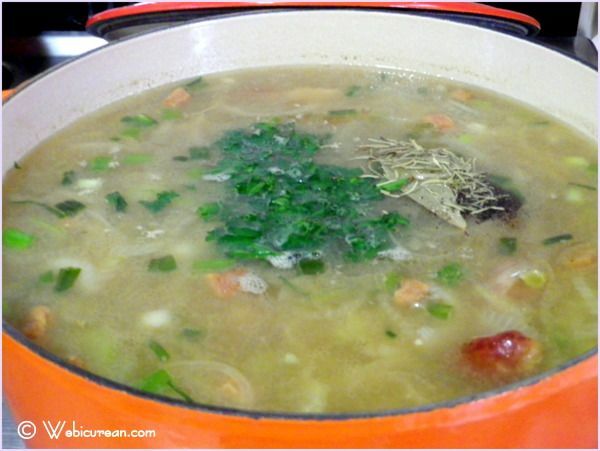 I would use the ham to replace the shanks/hocks–that’s where the soup gets its meat anyway. You can probably skip the salt pork if you’re adding bacon. The only thing I would be careful about is the ham stock–normally, I start with an unsalted or low sodium broth because the ham on the bone adds a lot of saltiness … if you’re starting with a salty stock, the whole thing could come out too salty (this has happened to me just from using regular stock) … maybe use half stock half water to balance it? OTOH if it does come out too salty, cutting up some potato into it makes a nice addition, and the potato will help soak up the salt. 🙂 Enjoy! This is a terrific recipe with so many options for adding different favors. One of our favorites is to add a small can of chopped green chiles. Leave out the Gouda and serve with warm tortillas. We are into soup weather!! Thanks so much Barb–that sounds delicious–I’ll have to give it a try! I sometimes stir in some of Mezzetta’s sliced jalapenos, and it’s wonderful that way! 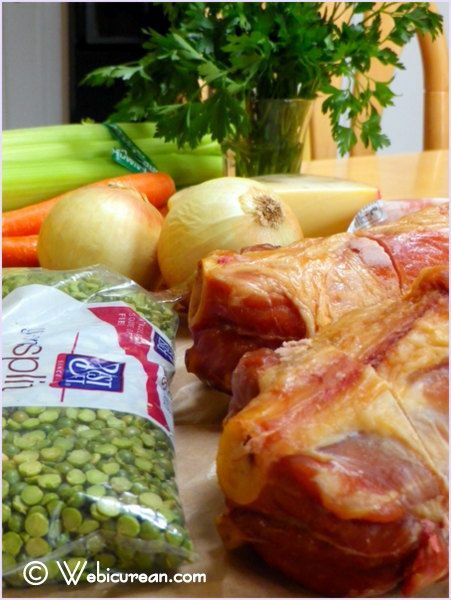 I have the leftover ham bone from Christmas in the freezer, just waiting for me to make this soup! 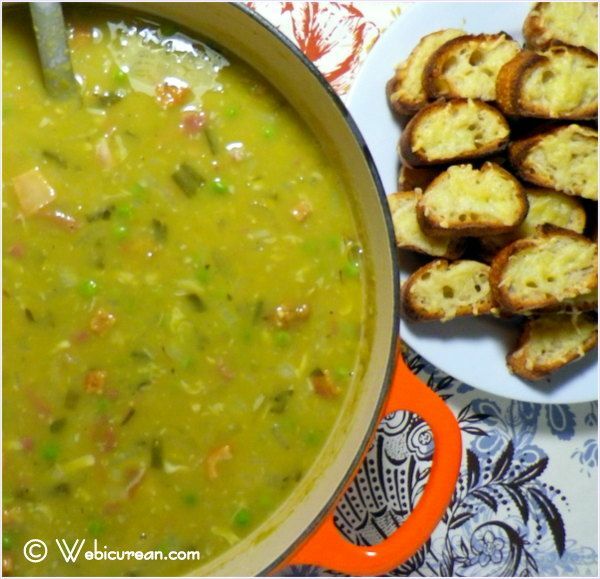 Anne just to let you know my dear husband says this is the best recipe EVER for split pea soup. Nex up I am going to tackle beef barley and try to make it a bit different. Love the story and am looking forward to eating this delicious soup tonight! I have made this a few times and every time I have to make alterations. Keep coming back to try to see if I can improve it. My advice, skip the salt pork and use bacon. I love soup. Make it once a week with the family. I like my food salty ( as most cooks do!) but the salt pork makes this completely inedible, even using low sodium broth. Like a fatty salt bomb. Blech. I’m sorry this didn’t work out for you! Bacon is a fine substitution. Often I simply use a leftover ham bone instead of the hocks, which may be less salty. You could also start with a completely salt free broth. When I know I’ll be making this, I make a batch of my own broth without any salt. I’ll take another pass at making this with the low sodium broth to see how I can improve the recipe. Most split pea recipes call for water instead of broth, so that’s always an option too, but I do love the way the broth enhances the flavor! InSalutis | Weekly Meal Plan & My Happy Things: Raw Caramel Dip, A Trip to Palm Springs, & More!